The Nuclear Baltic Map project is result of the Baltic Sea Infotour project. With the Baltic Sea Info Tour 2010 we focused on gathering information about nuclear issues around the Baltic Sea, images of these places and facilities, operators, critical groups, links and other resources to be used for the Nuclear Baltic Map. Now we will work on these materials to produce some brief introductions to these facilities and issues for the Atomic Threats Around the Baltic Sea book project. impacts of the radioactivity in the Baltic Sea to Denmark? e.g. in Sweden: transport of waste to Clab + SFR repositories by M/S "Sigyn"
In the storages of the Leningrad nuclear power plant in Sosnovy Bor, there is spent fuel equivalent to about 5000 tons of uranium. Since there is no intention to reprocess it, it will probably stay there for a long time. In Sosnovy Bor, there is also a regional management centre for radioactive wastes. In the storages of the centre there is 60 000 m3 of radioactive waste. Its total activity is about 10 petabecquerels (PBq = 1015 Bq). 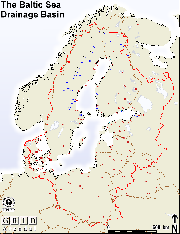 Source for Sweden: Pdf Report in swedish by Olof Holmstrand, of all prospecting applications and claims in Sweden as of December 2010, plus info about the active prospecting companies. This page was last modified on 21 July 2015, at 04:49. This page has been accessed 185,056 times.